The Kardashians could have learnt a lesson or two from her, or did, so did Paris Hilton, whose great-grandfather was one of her many husbands. But Hollywood actress Sari 'Zsa Zsa' Gabor was the original socialite, never letting her lack of acting prowess keep her name out of the limelight with her extravagant and glamorous lifestyle, a long string of marriages (and divorces) and a penchant for witty, outrageous quotes. Calling everyone "dahling" in her heavy Hungarian accent which she never managed to lose, the radiant blonde actress, who died in Los Angeles on Sunday aged 99, had 76 appearances in film and TV shows in a career spanning from 1951 to 1996. But apart from Moulin Rouge (1951), where she starred opposite Jose Ferrer and perhaps espionage/courtroom drama The Man Who Wouldn't Talk (1958), most were forgettable oddities like Queen of Outer Space (1958), Won Ton Ton, the Dog Who Saved Hollywood (1976) and Frankenstein's Great Aunt Tillie (1984), in supporting roles or cameos, and then increasingly self-parodies. Her TV appearances were marginally more known, especially in Gilligan's Island and as a special guest villain in Batman where Adam West was the caped crusader. "A man in love is incomplete until he is married. Then he is finished"
"I have never hated a man enough to give his diamonds back"
"I am a marvelous housekeeper. Every time I leave a man, I keep his house"
"Getting divorced just because you don't love a man is almost as silly as getting married just because you do"
"The only place men want depth in a woman is in her decolletage"
And episodes like when she sported a black eye courtesy of her then lover, or slapped a policeman who stopped her for an expired license. Asked why she called everyone "dahling", she quipped: "I don't remember anybody's name. How do you think the 'dahling' thing got started?" 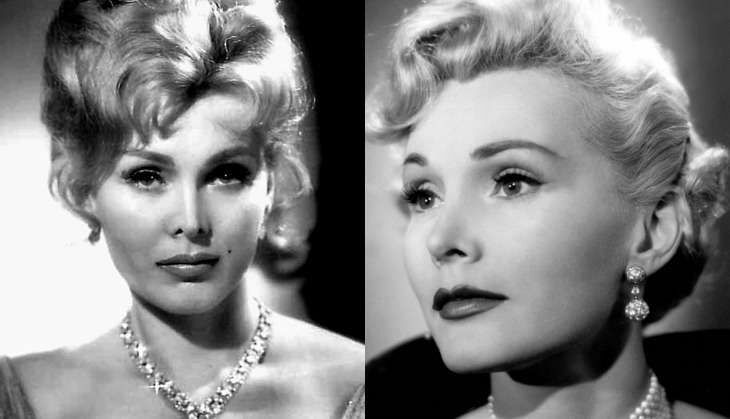 Born on February 6, 1917 in Budapest, then the second capital of the Austro-Hungarian empire in a Jewish family, Zsa Zsa, the second of three daughters, began her career on the stage in Vienna and reached a pinnacle of sorts when she was crowned Miss Hungary in 1936. She emigrated to the US in 1941, though it was over a decade before she was first seen onscreen in the MGM musical Lovely to Look At (1952). She was reportedly considered for a role All About Eve (1950), but Marilyn Monroe was cast instead. Zsa Zsa's second film, We're Not Married (1952), was also a small part, and besides, the presence of Ginger Rogers, Marilyn Monroe and Mitzi Gaynor made it difficult for her to be spotted. As it happened, her offscreen activities made her more famous, especially her nine husbands, beginning from Turkish politician and diplomat Burhan Asaf Belge (1937-1941), American hotelier Conrad Hilton (1942-1947), fellow actor George Sanders (1949-1954) and finally in 1986, German-American entrepreneur Frederic Prinz von Anhalt (born Hans Georg Robert Lichtenberg, he changed his name after paying Princess Marie-Auguste of Anhalt to adopt him but the old European aristocracy does not recognise his claims). But, Zsa Zsa didn't always have things all her way. When she was married to Sanders, she had an affair with a diplomat, and Sanders, known for playing sophisticated villains, was determined to find proof of her infidelity. As actor David Niven recounts in his autobiography Bring On the Empty Horses, Sanders asked him to accompany him, in company with a detective, photographer and a lawyer. The detective carried a ladder, so Sanders could straight away ascend to the upstairs room where he suspected Zsa Zsa and her lover were. In case anyone objected to this form of entry, the lawyer was there. Sanders carried a gift-wrapped brick to smash the window. In any case, it wasn't needed and Zsa Zsa, caught in the act, tried to play the innocent, telling Sanders she had a gift for him downstairs. He replied so did he, and handed her the brick. Lord of the Rings fandom, did you know we almost got David Bowie as Gandalf?